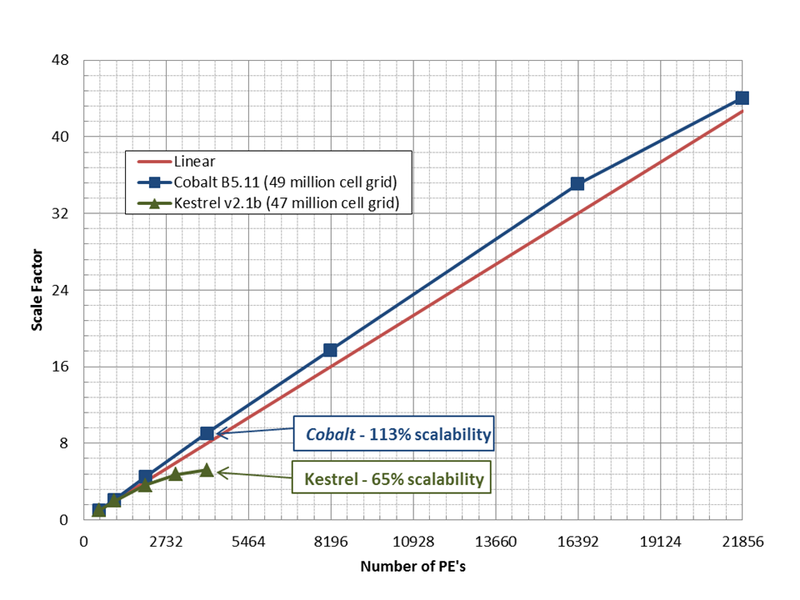 Cobalt is a fast, reliable and robust unstructured flow solver. It's scalability has been demonstrated on tens of thousand of processors. Included is a wide range of boundary conditions, turbulence models and rigid body motion types. Cobalt is a parallel, implicit, cell-centered, finite-volume, unstructured flow solver. The spatial operator is a second-order accurate TVD scheme based on Godunov's original first-order accurate, exact Riemann method. The temporal operator is a second-order accurate implicit method with Newton sub-iterations. Cobalt has excellent parallel performance. As you double your number of processors, your solution time is cut in half. This will hold until the number of cells on each processors because relatively small. As an example of scalability on 10,000 of processor, see the figure below. This grid contained 49 million cells and as super-linear at 21,856 processors. Cobalt offers a wide-range of boundary conditions. There are nine boundary conditions types with several methods in each type. Cobalt includes 24 turbulence models from one-equation RANS to DES to four equation RANS/LES hybrids. Multiple grids acting as a single grid system can be simulated using our Overset module. For more information, see Overset Module. Rigid-body motions in Cobalt belong to two broad classes: ‘free’ and ‘specified’. Free motions are those where the motion is determined by the forces and moments acting upon the body. Specified motions are those where the user specifies the motion. With the Overset module, grids can have independent motions. Non-rigid body motion can be simulated using grid deformation. For more information on our grid deformer, see Malleatus.